This cycling holiday invites you to discover the Entre Deux Mers (between two seas) area and its famous Sauternes vineyards, the pine forest of the Gascogne Regional Park, the Arcachon Bay and the ocean. You will take cycling tracks as well as small flat roads, and will enjoy the evening in charming hotels. You will enjoy the rides through the vineyards and Châteaux and also through the pine wood forest up to the Ocean and the charming Arcachon area which is a real gem to explore! Arrive in Bordeaux. Transfer by taxi to Rions your first guesthouse or 3 star hotel. Dinner. 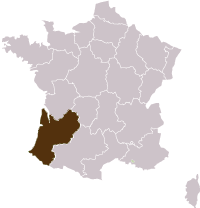 The “Entre-Deux-Mer” area. 40 km. 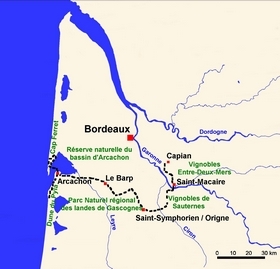 Biking through the Premières Côtes de Bordeaux winegrowing area and in the Côtes de Bordeaux Saint-Macaire area. Enjoy superb views of the Garonne River and visit the heart of the ancient merchant town of Saint-Macaire. The tour takes you to the fortified town of Cadillac and its castle, as well as to the Château Malrométhe the former residence of Toulouse-Lautrec, the famous painter and to the Domaine de Malagar where the writer François Mauriac used to live. Accommodation in a charming hotel*** in the medieval town of Saint-Macaire. Dinner & night. Through Sauternes Vineyards, towards the Landes de Gascogne Regional Natural Park. 53 km. The left bank of the Garonne River and twisting roads through the worldfamous vines of Sauternes areas, including the jewel : Château Yquem. The itinerary goes on to Budos, then through the valleys carved out by the River Ciron, to Leogats and Nouaillan. You then carry on to Balizac where you enter the Landes de Gascogne Regional Natural Park, before reaching the charming hamlet of Origne for the night. Here you are in the heart of the Gironde countryside to have dinner and spend the night in a cosy guesthouse. Through the Landes de Gascogne Regional Nature Park. 32 km. A lovely little forest road offering great variety takes you westwards. Heading towards Louchats, the pine forest becomes denser and the scent of pine resin richer. Leave your bicycle close to the lagoons of Gât-Mort and discover the water beneath a carpet of fern. Make a stop at the lakes of Hostens where the shadow by the shore is perfect for an afternoon nap. The road will then take you, between pine trees and heather, to the small town of Le Barp. Stay in a charming little stone built hotel**, and relax at the swimming pool. Take the time to appreciate local food on the terrace shaded by suspended vines and the cool gurgling of a fountain. Towards the Bay of Arcachon and the Ocean. 45 km. A little road in the pine forest takes you to Le Teich, where the Park meets the sea. Have a break in the ornithological park. The landscape opens out to the light of the Bay of Arcachon. Take the salty coastal path and follow the sea air to Gujan-Mestras. Hotel*** in Arcachon on the seafront. The highest dune in Europe, the dune du Pyla is worth climbing. Your trip ends after breakfast. Drinks (wine and coffee for the dinners). Transfer of the luggage from hotel to hotel. All lunches : picnics possible. Starts in : Bordeaux station. Ends in : Bordeaux Station. Access : Paris/ Bordeaux by TGV. Only 3 hours. Customize your tour : add or remove one night or more ; combine with another tour ! The region in our blog here !